This is a very timely publication for us in 'Bound and Lettered' from John Neal. I am posting the complete article written by Carol DuBosch so you may be tempted to see if you can control the syringe. Bound and Lettered originally appeared as Tabellae Ansata, it continues to publish articles on artists books, bookbinding, paper craft and calligraphy. http://www.caroldubosch.com Carol has a comprehensive website. Just in case you cannot read the type I have repeated it below. Carol used the Syringe Pen in making this hard-paged book with a bronze rod. The Book was created in Susan Longerot's "Explorations of Book Structures and Surface Design" workshop at 'Letters California Style ' 2014. This winter I attended a wonderful workshop with Italian calligrapher Massimo Polello. Among the many things that Massimo shared with us were the amazing marks he made using an ink filled syringe. The syringe is large (12ml) and has a short blunt needle. The style of the syringe is eccentric-tip - that is, the tip is offset, not centred. This offset tip can be held closer to the paper when it is used to create letters and marks.It is easy to fill the syringe with ink and other writing fluid. Iv'e used walnut ink, Higgins Eternal ink and bleach. 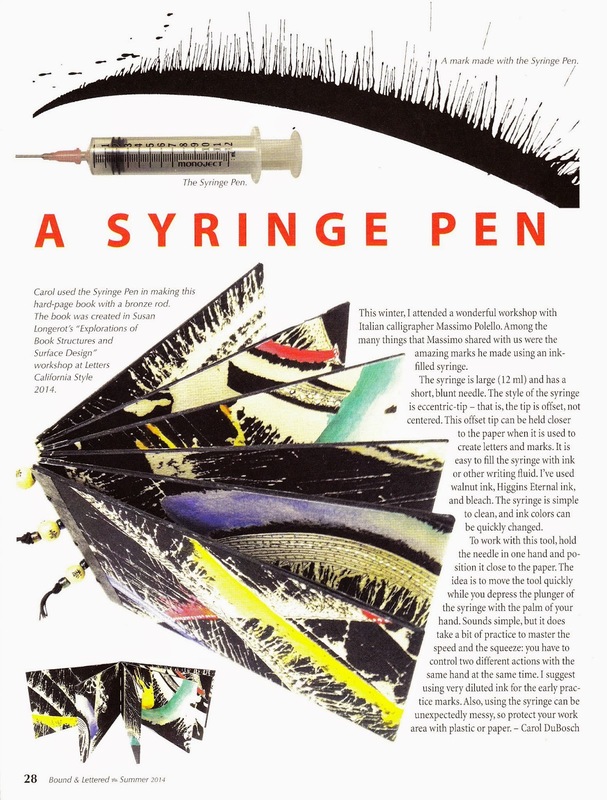 The syringe is simple to clean and ink colours can be changed quickly. Both Carol Dubosch and John Neal gave their kind permission to share this article. Thank you both.